Trafalgar Studios – until 08 October. 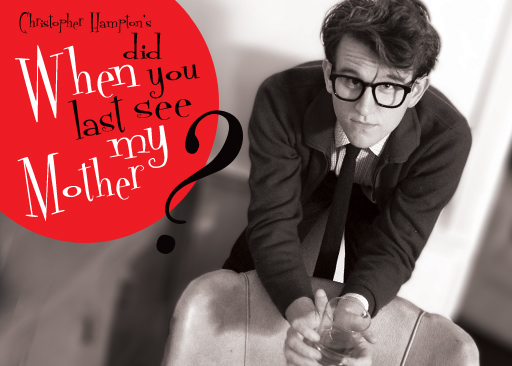 Written when he was 18 and produced for the Comedy Theatre two years later, When Did You Last See My Mother, marked Christopher Hampton’s explosive debut and meant that he was the youngest playwright of modern times to have a play staged in the West End. It opened to almost universally rapturous reviews and immediately propelled Hampton into the spotlight as a precocious new talent. After a career that includes The Philanthropist, Tales from Hollywood and the Oscar-winning screenplay for Dangerous Liaisons, When Did You Last See My Mother seems like it is from the distant past and almost unbelievably this new production at the Trafalgar Studios marks the first major revival of the play in the West End for almost 40 years. Currently the West End appears to be in a period of looking to the past; we have seen a number of Rattigan revivals in his centenary year, The Kitchen has just opened at the National and the Donmar will soon be staging Osborne’s Inadmissible Evidence. A reason behind these revivals is the belief that these three playwrights share an ability to create a universality of truth that can transcend the time when it was written; Rattigan finds his range across the spectrum of human emotion whilst Wesker’s masterpiece, The Kitchen, lays bare the individual within the machine. To expect that a play written by an 18 year old will reach such a level of truth is unreasonable and there are moments when it is clear that Hampton is still finding his ear for dialogue; in particular Jimmy’s mother must deliver a couple of lines that suggest a playwright still finding his feet in giving voice to a mature women; interestingly a theme mirrored within the play. However this production is full of moments that touch on the sublime and show us glimpses of a master honing his art. More crucially, Hampton is very strong on the undercurrents of sexual identity and class envy that run through the play and still feel immediate and challenging to a modern audience. The play conjures memories of two seminal Sixties films, The Odd Couple and The Graduate, and it comes as a surprise to discover that, written in 1964, the play foreshadows both and contains more daring plotting and greater psychological depth. Ian and Jimmy, friends from school, share an apartment and using their new found freedom they are looking to explore their sexually identities, Ian believes himself to be gay, almost defiantly so, whilst Jimmy, who we understand has had encounters with men seems to be more ambivalent; something that Ian, filled with a self-destructive honesty and a longing for Jimmy, cannot abide. Jimmy’s mother enters this world, discovering a freedom in their lifestyle absent from her own upbringing and looking to rediscover her own identity, which ensures all the elements are in place for this angry, bitter comedy to reach its denouement. The cast work well in such an intimate space, in particular Harry Melling, who restrains the urge to go for broke as Ian, is spectacularly awkward and has the audience squirming. He appears at time little more than an ungainly mass of elbows, knees and flailing limb held together only by his acerbic remarks. His frustration is magnified through his action, constantly playing with his hair and unable to sit still, liable to switch from intelligent banter to self-loathing in an instant. We understand why Jimmy’s mother sees both the face of a mature adult and petulant child in him. Melling manages to humanise a character that could have come across as deeply unsympathetic. Abigail Cruttenden is also excellent as Jimmy’s mother; mixing repressed desire with a very human dignity. She is an intelligent women torn between desire and duty, self-aware enough to recognise the peril of embracing the social changes enveloping Britain. It is her knowledge of this that underscores the gap in maturity between the two and sets Ian’s pretensions against her real-life experiences. Cruttenden’s performance contains the tragic heart of the play beats and Jimmy’s entrance at the end of the second act is laced with a cruel dramatic irony as a result. One criticism would be the slightly mechanistic plotting, particularly in the second act. Even here though there are signs of a playwright understanding and subverting convention. The most beautiful moment of the play is the repetition of Ian telling his story of a lecture at the Sorbonne, subtlety changing the ending to reflect the mood and displaying a tenderness that is often hidden. When Did You Last See My Mother is a very good play but a difficult one to revive effectively. It is to the credit of director, Blanche McIntyre, that she has taken on the challenge and produced a period-play that maintains relevance almost 50 years later. Supported throughout by performances that balance moments of sensitivity with a savage frustration driven by repressed sexuality, it avoids the temptation to fall into farce in the first act and ensures that the inevitable conclusion retains its power. My partner of 19 years wrote + SOLD this play when he was 18! He is still the youngest cool guy to have a play produced on the WEST END. A great excuse to rush to London to enjoy it and learn from. WHAT WERE YOU DOING AT 18? I agree Tiana, it works well as a period piece whilst also feeling relevant. Congratulations to your Mr Hampton! The only sad thing is what it might do to aspiring playwrights when they discover it was written by an 18-yr old!